Get that mulch out now, add that layer of sponge which if we have another dry summer, you will be pleased that you have done this. Tidy your lawn edges if you don’t want to mow yet.Cutting your grass often and leaving it to break down naturally is the best thing to do. Dead head daffodils and start to enjoy your tulips.Do not be tempted to cut back the green leaves. Keep on top of hoeing, ephemeral weeds, great opportunity for a cure but leave some dandelions for our garden pollinators. 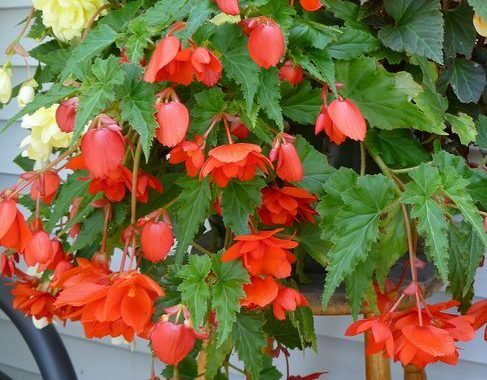 Plant summer bulbs, corms, tubers either into the ground or pots.Often these bulbs are what make our gardens interesting at the dullest time.Such as Gladioli, Lilies, Calla Lilies, Dahlias and Begonias – Potatoes are tubers. 1. 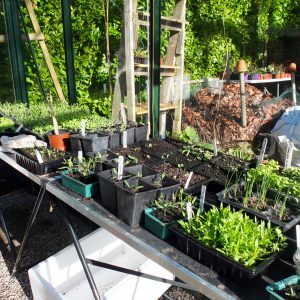 Pot on seeds now ready, those with true leaves about two whorls high into a potting mix which will give them nourishment.Such as found in John Inns no 2 Also lots more seeds to be sown now, check your existing seed packets and sow what you want and can. 2. 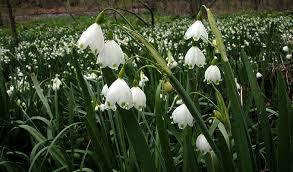 Divide clumps of Galanthus sub. ( snowdrops) and place in an area where you wished they were and also will not be disturbed when dormant.You can still divide clumps of perennials and most importantly cut back grasses before they really take off with growth which would make it extremely difficult later on. 3. Keep hoeing paths and beds with an Osslating Hoe ( I have some here for sale) my favorite tool .By doing this you are preventing weed development, also churning slug eggs to the surface making a delicious meal for birds. Also check to see if you have frog spawn in buckets ponds etc and treasure it. Frogs are very beneficial in a garden. 4.Cut grass if dry. If the ground is wet wait as a heavy lawn mower will form ruts and compaction. If you have a lawn with obvious edges ( unlike mine ) consider a robot lawn mower lovely and light. 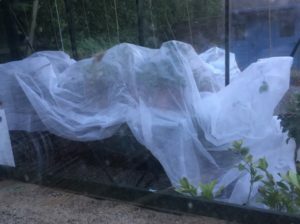 5.Keep an eye on the weather,protect vunerable plants with fleece or straw, especially tree ferns. Potted plants group together and shelter. 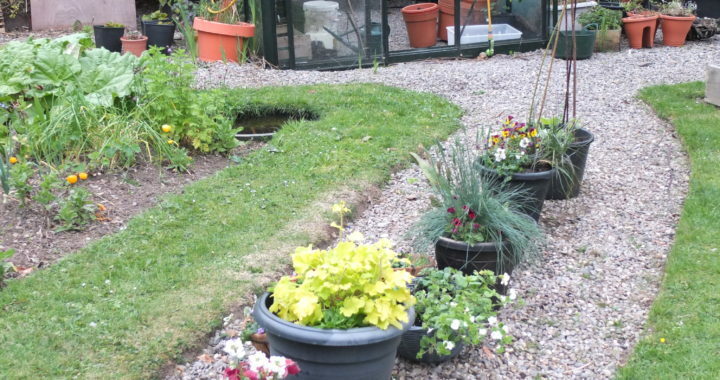 Also it can be drier than you realise so check potted plants for watering, even though they don’t need much water, growth is about to begin so demand will increase. 1. Cut back or namental grasses such as Stipa gigantia, Calamagrostis x acutiflora ‘Karl Foerster’ Grasses such as Stipa tenuissima – Pony Tail grass, Stipa arundinacea better to pull your fingers through and remove spent fronds.Better to wait until the soil warms up before dividing clumps of grasses and there is better new growth. 3 Plant bear rooted trees and roses .I prefer to plant my roses when in flower so that I am sure I have what I want – labels can get mixed up.Planting bear rooted trees often allows you get great value, also good root /soil connection. Using a Mycorrhizal fungi can also add dividens creating that bridge between root and soil. At the moment growth is very much ahead of itself, I would advise not to be complacent, remember St Patricks day last year — snow. There is lots more to do but I don’t want to frighten you. It is really worth your while to hoe weeds now on paths and hand weed between your bulbs.One more thing, if you are lucky enough to have clumps of snow drops , you can lift some and replant into positions where you would like to enjoy them in the future.My favourite hoe is the Swiss Osslating one, I have some in stock, if you are looking for one. Gardening Classes are also starting now and the next 6 week course will commence on Tuesday 26 /Thursday 28 March with Easter in the middle. Saturday, March 4. I will be holding a morning workshop on Willow Weaving, such a beautiful material to make garden supports with and more.This is always a popular morning. Later on in March 23 Klaus Leitenberger will be here, all the way from North Leitrim. Klaus is the author of several Vegetable Gardening Books based on his experience of growing here in Ireland. This unique opportunity to have such an expert share his knowledge. Vegetable Gardening and Planning Numbers are limited early booking is recommended. Gardening opens up and awakeners an awareness to our environment, the life and beauty it holds for us. Growing our own food, harvesting our own flowers, sounds of life, swish of plants, what more could we need! 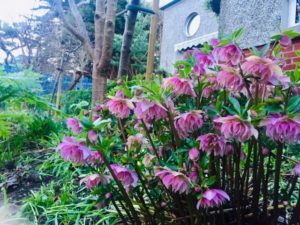 A healthy vibrant gardens add so much to us, here in Dalkey Garden School we inspire you to be the best you can, to enjoy and see what is all around us.What we do, how we garden does matter. Classes are open to alland those who want to do more. Enjoyment and sharing are key and we will be starting on with Tuesday 29 or Thursday 31st January 10 – 1pm. Wow, the weather is so mild so if you are like me still have some tidying up in the garden get out now because winter will arrive. Remember the snow last March ? If you are not lifting your Dahlias, cover with a nice blanket of mulch as deep as you can. Canas, Gingers , Aeonium,lift or if you can add a protective cover,or take cuttings. Still time to plant tulips and garlic( they like a good cold snap).Have a good look at your garden, look up and check on crossing branches, prune your trees, for shape and protection. Crossing branches can rub each other and cause damage to bark. I know it is nice to have a tidy garden ,even house but in the garden leave areas for our hibernating friends. The garden will be opening to visitors in March and our first workshop will be on Saturday 26 January, Cathy Soroghan of Women on the Run will be with me helping us cook healthy meals which will help us with our energy levels, something I am always looking for. I will be showing you how to plant and choose salads, veg for a miniature garden.Hope you can make it and again HAPPY NEW YEAR. The gift of Learning. 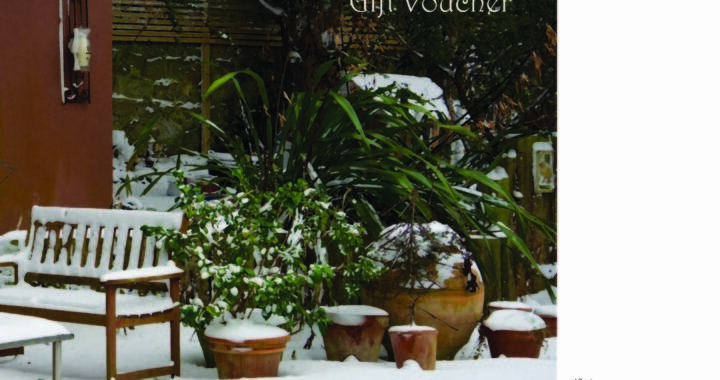 Gift vouchers can either be posted out or sent via email. 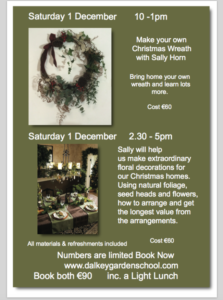 All workshops include materials, light lunch and refreshments.